Multi-Hand Blackjack is one of the most popular blackjack variations. This blackjack game is played with five decks of cards. What makes it unique is that players can, and are encouraged, to play up to five hands at once. 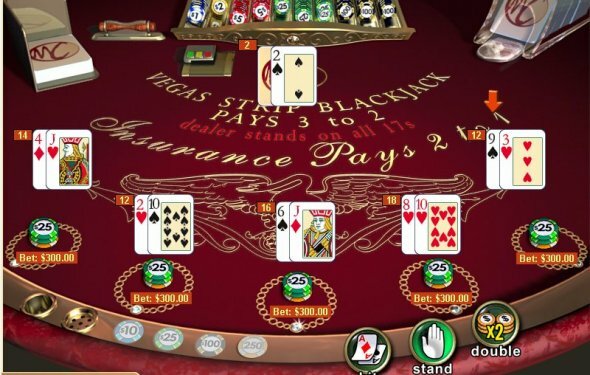 Like all blackjack games, the game of Multi-Hand Blackjack is a gambling card game that is played against a dealer. The player's objective is to obtain a hand that is worth a higher value than the dealer's hand, without breaking a total of 21. For the most part, standard blackjack rules apply in Multi-Hand Blackjack. Each player places a bet and is then dealt two cards. Based on these cards and the up-card of the dealer, players must decide to stand, hit, double down or take insurance. If a player beats the dealer then they are paid; if a player loses then they must surrender their bet. The dealer must always stand on a hand that totals 17 or more-it doesn't matter if it is "soft 17" or "hard 17"
The dealer does not check their hole card for blackjack until the end of the hand. This is known as a full no peek rule. Once you familiarize yourself with the basic rule differences between standard and Multi-Hand Blackjack your next step should be familiarizing yourself with Multi-Hand game strategy. The chart below illustrates the basic odds strategy for No Peek Multi-Hand Blackjack. Well you don't have the courtesy to tell us which hand and what time stamp. So the only thing I will tell you is the obvious. You don't take insurance!